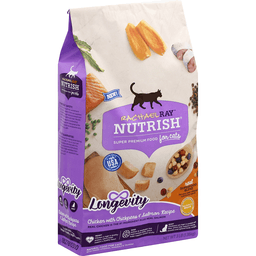 Rachael Ray™ Nutrish® Natural Food For Cats Longevity. New! Super premium food. Safely USA cooked with the world's best ingredients. Real superfood blend for your cats' lifelong nutritional needs. Chicken with chickpeas & salmon recipe. Real chicken is the #1 ingredient plus real salmon. Heart: Chicken is high in quality protein, which helps support a healthy heart. Mind: Salmon & menhaden fish meal contain DHA, which helps support mental acuity. Body: Chickpeas are high in protein and fiber, which help support strong muscles and optimal body weight. With added vitamins, minerals & taurine. Net Wt 3 lb (1.36 kg). Simple. That's how I like my recipes. That's why I worked with cat nutritionists to create a simple, wholesome food to help your cat live a long and happy life. Rachael Ray™ Nutrish® Longevity starts with real U.S. chicken as the #1 ingredient. Then I carefully combined it with real salmon and a unique superfood blend to help with all your cat's lifelong nutritional needs. It's a delicious, natural food with added vitamins, minerals and taurine to help keep your cat healthy and happy for a long time. How good do you feel now Thoroughly crafted without any: Ground corn, wheat or soy. Poultry by-product meal or fillers. Artificial flavors or artificial preservatives. Heart: Real chicken is the #1 ingredient, and it is raised on U.S. farms. This tasty, high-quality protein helps support a fit heart and strong muscles throughout life. Mind: Real salmon is an easily-digestible protein that helps support healthy organs and muscles. Menhaden fish meal is a natural source of DHA, which helps support mental acuity. Body: Chickpeas are naturally rich in protein and fiber and low in fat, which help support lean muscles and optimal body weight. Plus: Chicken meal is naturally rich in calcium and omega 6 fatty acids, which help support strong bones and teeth and healthy skin and coat. It also contains taurine, which helps support healthy vision. Cranberries & blueberries are antioxidant-rich fruits that are great sources of essential vitamins and minerals, like vitamin C, which helps support a healthy immune system. Pumpkin is naturally rich in fiber, which helps support healthy digestion. Big taste! Our team of cat nutrition experts developed a new kibble piece with your cat's unique palate in mind. We create an optional crisp & crunch your cat will love, and our smooth kibble is an ideal small size for your cat to chew & swallow. Real recipes. Real ingredients. Real good™. Made with safe, high-quality ingredients. 100% Complete & balanced nutrition for cats. Dry pet food safely cooked in only U.S. facilities with the world's best ingredients. Only the best, high-quality, carefully chosen ingredients - never any ingredients from china. Every trusted ingredient supplier goes through rigorous qualification and testing. Backed by 80+ years of focused excellence in pet nutrition. Learn more: www.nutrish.com/ingredients. Ingredient Safety: At Ainsworth Pet Nutrition, we demand high-quality ingredients from our suppliers and require thorough testing to ensure our ingredient specifications are met. We are committed to producing outstanding products every day and take great pride in ensuring our foods are wholesome and, most importantly, safe. Rachael Ray™ Nutrish® Longevity Chicken with Chickpeas & Salmon Recipe is made for cats of all sizes. Rachael Ray™ Nutrish® Longevity Chicken with Chickpeas & Salmon Recipe Cat Food is formulated to meet the nutritional levels established by the AAFCO (Association of American Feed Control Officials) Cat Food Nutrient Profiles for all life stages. Guaranteed Analysis: Crude protein (Min.) ... 34.0%. Crude fat (Min.) ... 12.0%. Crude fiber (Max.) ... 5.0%. Moisture (Max.) ... 9.0%. Calcium (Min.) ... 1.0%. DHA (An omega 3 fatty acid) (Min.) ... 0.05%. Taurine (Min.) ... 0.20%. Omega 6 fatty acid* (Min.) ... 2.0%. Ascorbic acid* (Source of vitamin C) (Min.) ... 150 mg/kg. Calorie Content (calculated): Metabolizable Energy (ME) 3,559 kcal/kg; 371 kcal/cup as fed. *Not recognized as an essential nutrient by the AAFCO Cat Food Nutrient Profiles. "Rachael Ray" and all related marks are trademarks of Ray Marks Co., LLC. "Nutrish" is a registered trademark of DPC Pet Specialties, LLC. All rights reserved. Quality Guarantee: We are committed to making great-tasting, nutritious pet foods. If you or your pet are not completely satisfied with this product, we will provide a full refund. For Questions or Comments, please Call: 1-800-323-7738 weekdays from 9 a.m. - 9 p.m. EST, or weekends from 9 a.m. - 5 p.m. EST. Visit: www.nutrish.com. ©2018 Ainsworth Pet Nutrition, LLC.